I read an article by Iain Abernethy titled “Karate’s three biggest mistakes”, and I remember even while I was reading it that I thought I wanted to examine the mistakes made by kung fu and see if there could be some discussion in the kung fu community and even possibly some progress in addressing the problems. There are some issues which can come up in doing this, so let me first say that these problems I list here are being noticed and addressed by some instructors. Also let me be clear, I am giving this as an opinion and an effort to at least begin a discussion. Some of these items are widely seen as a problem, but are not discussed as it can be seen as very bad form to change some ideas which are so widespread. I have trained in Hung Gar since ’83. I have given myself to the training of this style as my core fighting system, and my basis of knowledge for anything that I have truly internalized in the martial arts. I have trained in other styles, but this has always been my core system. What appealed to me about Hung Gar originally is that it was impressive to watch, and undeniably effective in function. I stayed with Hung Gar for the reason that anyone stays with any martial art, I got along quite well with my instructor. And although I have had training in other Chinese, as well as Okinawan, Japanese, and Korean martial arts, my heart has always been in the Chinese Martial Arts. This is not to say that the Chinese systems are superior, only that they suit me better. Hung Gar is a perfect system for my body and temperament. Speaking strictly from a Chinese martial arts point of view, I see the following as mistakes which really should be addressed in order to ensure the survival and prosperity of the Chinese martial arts. Here is my list. 1 – The failure to rely on science. While there is much to be said for holding on to some of the traditional aspects of the Chinese Martial Arts, one aspect which we could drop (if we were willing) is the use of pseudoscience. The reason that so many MMA students turn into aggressive (and sometimes loud) people when a traditional Chinese Martial Arts practitioner is around is simple. There are many, many CMA people who rely on pseudoscience. As MMA students are regularly testing the effectiveness of what they are being taught, they know the subject of practical application well. Much of what is claimed by people who believe some of the mystical martial arts nonsense looks like BS to a student of MMA, and is laughed at because they see it as too ridiculous to hurt anyone. They are not verbally degrading CMA out of fear, but talking down about it as it is seen as absurd to them. Some of these CMA masters make claims well beyond anything possible in the real world. The “masters” will also use facts which cannot be verified, use mythology as a source, ignore anything which may contradict their claims, they make liberal use of subjective validation, and tend to place their faith, as well as the basis for their arguments and claims on ancient ways of thinking. The older the idea, the more reasonable and sound it will be in the eyes of the “master”. In English, I think it would be most wise for the instructors to begin to replace the vague word “Qi” with the clear and descriptive words “efficient biomechanics” or “proper body mechanics”. Because in the world where we live, this is the only definition which can be scientifically accepted and tested. The definition of “life force” cannot be measured and charted. You are alive or you are dead. I am not saying there is no such thing as life force, obviously most of us are alive so there MUST be something going on there, but there is no way to study it or observe or test. Remember, it has to be observable, explainable, testable, and repeatable. Qi is used most often to create an aura of secret and hidden knowledge. It is intentionally vague because most people who ask the kung fu master a question and are given the answer “Qi” will usually sit in awe of this amazing stuff that makes the technique something supernatural. For much of my early training, I wanted to be near people who had this mysterious stuff, as if though mere proximity, I could get some of my own. Even today, I would give almost anything to see superpowers. After many disappointments where these masters were either unable or unwilling to reproduce the magical effects of their super kung fu on me, I began to see the truth of what my own instructor had told me for so long. The only secret is kung fu. Kung fu means “hard work”. The only secret is hard work. There is more magic in a suspension bridge than in any martial art. When asked if I believe in Qi, I first have to ask someone to define Qi. If the definition given is this magical nonsense, I have to say a flat no, I do not believe. I cannot prove it does not exist, but the responsibility for proof will lay with those who propose that it does it exists. When I teach my students, I show them different ways to test, and thereby prove what I am telling them to be true. If it doesn’t work in different situations, and under less than perfect situations, then it is of little value. There was one Qi master who gave a demonstration but was unable to reproduce the effects on a reporter. The excuse he gave was that it didn’t work because the reporter didn’t believe it would work. Really! All it takes to nullify the effects of a Qi attack is to not believe it? Good! I am immune! A few years ago I commented honestly from the heart about these and a couple of other videos, and was threatened with a lawsuit by one of the people involved, so I must tread lightly here, but the mystical claims are false. There is nothing here except some people believing in some nonsense. Real martial arts are brutal, and some of the strikes can result in permanent damage or death, but not because of Qi. It will be based on proper body mechanics and proper targeting of the strike and nothing else. If the instructors of the Chinese Martial Arts could take that leap of faith and let go of the silliness, we could once again be taken seriously in the martial arts community. This is not to say that there are no Chinese Martial Arts instructors out there teaching the real thing. There are many, but you will need to ask questions and listen to the answers, and not let yourself be swept away by some of the mystical looking skills that you may see. 2 – Not understanding the application of the forms. The Chinese Martial Arts have a pretty bad reputation when it comes to some of the other martial arts. Through time, many of our styles have become very pretty, and often this comes with a loss of functionality. Those few who do try to show the application of the techniques sometimes make some further mistakes that exacerbate the misconceptions of our arts though not understanding the reality of fighting. We often refuse to admit that there is a lot on useless garbage in our forms. Pretty hand gestures, flips and rolls, and gymnastic like poses are found throughout the Chinese Martial Arts systems. However, when one becomes secure enough to study the applications and stay open minded enough to admit that there are some of the things we do in our forms that serve no purpose in the area of self-protection, then we can open an entirely new field of study. I have gone through one form so far, and am working on the rest in my system, in an effort to identify what parts are useful and which are not. For the parts that are useful, I study with a specific idea – will this application work in a chaotic environment. When training applications you need to be sure that you keep in mind all of this. Will it still work with all of the things going wrong? I taught a poor application for Hung Gar’s “wave punch” for years. Just imagine swinging a kettle bell from lower right to upper left and you will have a pretty close idea of what the wave punch is. I was taught originally that it was an arm breaking technique. I later decided that this was impossible, and taught it as a simple swinging arm strike to the underside of the chin. 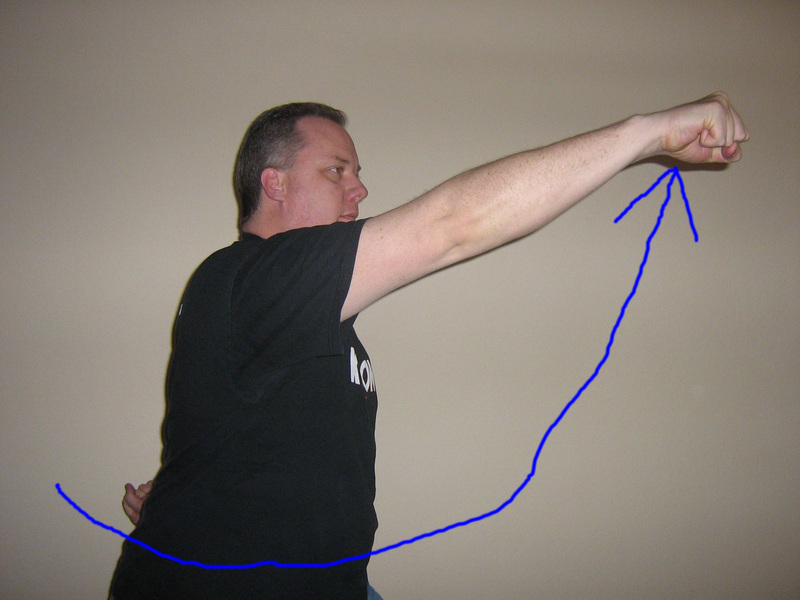 Then in (of all places) a taekwondo school, I used the wave punch without thought – as a deflection of a front kick! Dumped my surprised opponent right down on his keester and left him wide eyes for a few moments. This was when I came to first really understand that the applications are not really going to be all that complicated. Anything that you teach, or are taught as an application needs to be field tested. I am not suggesting going out and getting into bar fights. I am saying that once you understand the idea that you are being told and are able to perform it with a willing partner; they need to start becoming a less helpful partner. They need to gradually become more resistant to what you are trying to accomplish with the technique and finally end with being completely uncooperative. If the idea cannot be done with an uncooperative opponent, do you really think it will work when you need it and have adrenalin AND an uncooperative adversary to deal with at the same time as well as a host of other circumstantial and situational issues? There are other considerations to be made when seeking the proper application of any technique, but the study really needs to be made. When you come across something that has no value, admit it and move on. Our art does have a history of being used for entertainment and other types of performance activities, and a lot of the stuff that has no meaning and no functional use is going to come from this. This does not mean that we need to cut out the parts which have no martial application, only that we need to be aware of what is a pose, and what is fighting. Take the extra time to study the forms from a viewpoint of practical application and you can be a part of a turn for the better in the Chinese Martial Arts community. 3 – A heavy stress on lineage and politics. In Chinese martial arts, as well as martial arts of some other nations, there is a great amount of pride given to lineage. This is relatable to the way in which people may take tremendous pride in the University they attended, even wearing their team colors years after they graduated. In the Chinese Martial Arts, there is a great deal of pride as well as bickering over who learned what from whom. I want to take a look at this from two points that I feel very strongly about. First, skill is not hereditary. Just because So-n-So’s Dad was a great kung fu master does not necessarily mean that the son is going to be a great master as well. My Father was a bricklayer, and a fantastic one at that. He did beautiful work. He taught me and taught me, and taught me, and I was never more than an acceptable bricklayer. There was nothing special to my work, and I never built anything truly remarkable. If skills are not hereditary, what on earth makes people believe that training under a well known master means they are as good? Second, well known does not = “THE BEST”. It just means well known. In some instances the masters were well known because they were remarkable masters of the art. But in other cases, they were well known because of who they knew. Connections have always been important. This still does not pass on to the next generation though. The best instructors I ever trained under were those men and women who put their heart and soul into the training, and had that relentless drive toward self improvement. They never rested and said, “I’m there! I’ve arrived!” They always put something out there ahead, and one goal reached only meant it was time to set another goal. The point of the training is not found in who I learned from or in who you learned from, it is in the training itself. Well, there you have it! My list of the three things I think are wrong with Chinese Martial Arts. I think if we, as a community of CMA practitioners would try to address these three issues, we could go a long way toward restoring the respectability of our arts. I found this through Iain Abernethy’s Facebook post. Really good comments you make here. I enjoyed the read thanks. I appreciate the kind words! Thank you.